A laid-back atmosphere and stunning beaches are among the charms of the southern town. DAWEI — Boys on a motorbike are racing down a dirt track toward the beach, a heavy bass thumping out from what sounds a lot like reggae wafting in the air in their trail. Nearby, a group of young Myanmar lads, some with long hair, are lounging in a bamboo shack. There’s a kind of laid-back vibe about that feels not entirely unfamiliar. 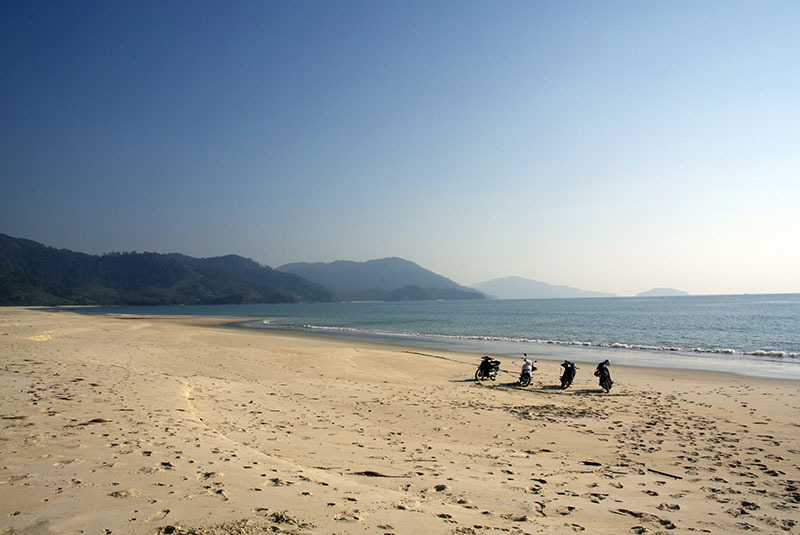 Welcome to the deep south—to the Dawei peninsula, more specifically. Thai beach culture has yet to truly cross over to this side of the isthmus, but there are hints of what could be. The conditions to support it—white sand and a soup-warm sea—are all here. Just maybe, this is the vanguard of a movement that will see these untouched beaches in Tanintharyi Region sporting red, green and yellow Rasta’ flags. It is noticeable that many people speak Thai around here. 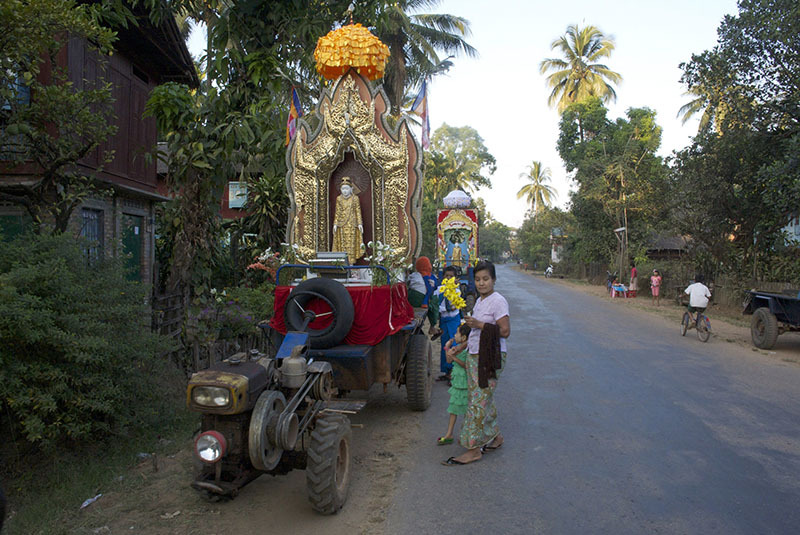 Many Dawei locals have traveled to Thailand for work, this part of Myanmar being a relative backwater, even within the region’s least dynamic economy. That could change, though, since it is now easier than ever to get here. A recently opened road link means that you can go from Dawei to Bangkok in a day of overland travel. This could make the beaches a useful stopover for creative visa runners, and it at least opens up this stunning area to more visitors. I traveled to Dawei overland from Yangon by road on a journey that took around 18 hours in total, though we broke it up along the way. Flights to the town are also available, and a train runs slowly but regularly from Mawlamyine. There are guesthouses in Dawei town or you can stay at the Coconuts Guesthouse, managed by a Myanmar-French couple, around a half-hour’s drive away. 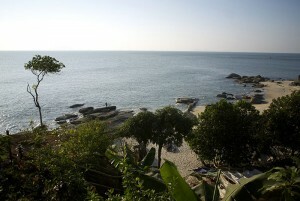 It’s a less than 10-minute walk to Maung Ma Gan beach, the easiest local strand to visit. The guesthouse has basic but comfortable rooms for around US$25 a night. Groups may pack into one of the larger bungalows for an extra charge per person. Food is served on low tables on a cozy wooden terrace and consists mainly of freshly caught seafood. The tuna, squid, prawns and variety of fish come with Myanmar salads and Thai papaya salad. Though life is still very quiet here, an increase in tourism looks likely soon at Maung Ma Gan. There is a brand-new hotel right on the beach and others are under construction. Recently the beach was covered in litter, so if the new businesses initiate a clean-up, this could be a good thing. 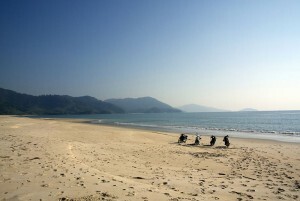 From Dawei, you have the choice of more beaches to the north and the south. To the north is Nabule beach, the jewel in the crown of the region. But enjoying this extra-long stretch of white sand has a bittersweet edge, since it may not be possible for long. This is the planned site of the $1.7 billion Dawei Special Economic Zone, a stalled project with ambitious reach that, according to recent reports, is being restarted with a new Thai-Japanese partner joining the original developer, Italian-Thai Development (ITD). The beach is unlikely to survive intact if or when a deep-sea port, factory zone and the terminus of a major new highway make this the dropping-off point for goods bound for Bangkok. Get here while you can. To the south, a rented motorbike will take you to a handful of remarkable strands within a 90-minute ride. First, there is the gorgeous curve of San Maria Bay, nestled into one side of a spit at the end of which is a pagoda built over the ocean. The only other building anywhere near the beach is a small, rustic cafe serving tea-leaf salad and bottles of beer, mainly to fishermen whiling away the hours. A little further south is Tayzit beach. To get here you must drive onwards through a few scenic villages and over a tough mountain pass, before you head down a sandy track and on to the beach. When you’re ready to leave Dawei, it’s no trouble to arrange a ride to the border, which takes about five hours. The road on the Myanmar side is at present an unsealed track skirting a river through the mountains. The 20,000 kyat ($20) charge for half a seat in a minivan is likely accounted for by the numerous checkpoints on the way, at each of which our driver handed over cash to men with guns (both “state” and “non-state” actors, in the current terminology). The border crossing itself is a confusing muddle, and it is not clear what might be the best way to cross. With a few other travelers, I asked a Thai man driving a pickup if we could jump in. He kindly obliged, and took us through a few kilometers of no-man’s land. The gravel road drops onto a four-lane blacktop road and you know you’re in Thailand. At the Thai border checkpoint, Myanmar migrant workers form a long queue, and tourists are ushered past. Once you’re in Thailand, bona fide reggae bars are not far away—it’s just an hour to Kanchanaburi or three hours to Bangkok by private car. This article originally appeared in the Mar. 2015 issue of The Irrawaddy magazine.